Pravastatin is a drug that belongs to a group called inhibitors of HMG CoA reductase, or “statins”. This drug reduces plasma levels of “bad” cholesterol (LDL – low-density lipoprotein,) and triglycerides, while increasing levels of “good” cholesterol (HDL high-density lipoprotein,). Pravastatin is a synthetic lipid-lowering substance. It is also an antilipemic fungal metabolite that can be isolated from fungi cultures of Nocardia autotrophica. Pravastatin is used together with diet, weight-loss, and exercise programs to decrease the risk of heart attack and stroke and to lower the chance of heart surgery that will be needed in patients who have heart disease or who are at high risk of developing heart disease. 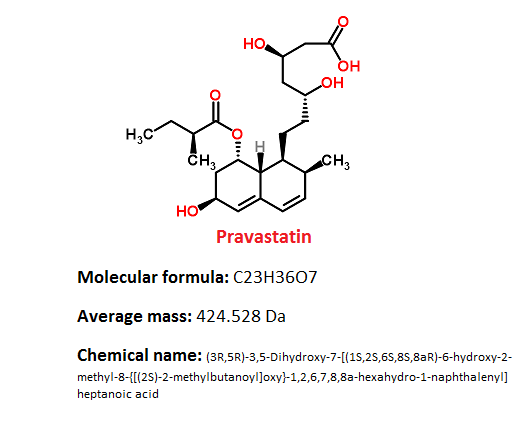 Pravastatin is also used to decrease the amount of fatty compounds in the blood such as low-density lipoprotein (LDL) cholesterol also known as ‘bad cholesterol’ and triglycerides in the blood and to increase the amount of high-density lipoprotein (HDL) cholesterol also known as ‘good cholesterol’. Cholesterol and fats accumulation along the walls of arteries (atherosclerosis) reduces blood flow and, therefore, the oxygen supply to heart, brain, and other parts of the body. Pravastatin has been shown to prevent heart disease, angina pain, strokes, and heart attacks by lowering cholesterol and fats values in the blood. However, the evidence of pravastatin administration is generally weaker compared to other statins. The antihypertensive and lipid-lowering treatment to prevent heart attack trial (ALLHAT) has failed to prove a difference in all-cause mortality or nonfatal myocardial infarction or fatal coronary heart disease rates between patients who were receiving pravastatin 40 mg per day, which is a common initial dose and those were receiving usual care. Reduce the risk of myocardial infarction. Reduce the risk of myocardial revascularization procedures. Reduce the risk of cardiovascular mortality with no increase in death from non-cardiovascular causes. Reduce the risk of total mortality by reducing coronary death. Reduce the risk of stroke and transitory ischemic attack. Lower the progression of coronary atherosclerosis. As an adjunct therapy with diet to decrease elevated levels in blood of total cholesterol (Total-C), triglyceride (TG) low-density lipoprotein cholesterol (LDL-C), apolipoprotein B (ApoB), and to increase the blood levels of high-density lipoprotein cholesterol (HDL-C) in patients with diagnosed primary hypercholesterolemia and mixed dyslipidemia (Fredrickson Types IIa and IIb). As an adjunct therapy with diet for the treatment of patients with elevated serum triglyceride levels (Fredrickson Type IV). For the treatment of patients with diagnosed primary dysbetalipoproteinemia (Fredrickson Type III) who do not have adequately results with diet. LDL-C remains ≥160 mg/dL and there is a positive family history of premature cardiovascular disease or two or more other cardiovascular disease risk factors are present in the patient. There are no studies about Pravastatin for conditions where the major problem is lipoprotein abnormality of elevated chylomicrons (Fredrickson Types I and V). Pravastatin belongs to the class of organic compounds known as carbocyclic fatty acids. These are fatty acids contain carbocylic ring. Pravastatin sodium is white to off-white, an odorless, fine or crystalline powder. It has partition coefficient (octanol/water) of 0.59 at a pH of 7.0. and it is a relatively polar hydrophilic compound with a partition coefficient (octanol/water) of 0.59 at a pH of 7.0. It is soluble in methanol and water, slightly soluble in isopropanol, and practically insoluble in acetone, chloroform, acetonitrile, and ether. It has Melting Point on 171.2 – 173°C. Pravastatin is available only in form of tablets in following strengths: 10, 20, 40 and 80 mg.
Pravastatin is structurally similar to the HMG (3-hydroxy-3-methyl-glutaryl), which is a substituent of the endogenous substrate of enzyme HMG-CoA reductase. Different from mevastatin, its parent compound, and statins such as lovastatin and simvastatin, pravastatin does not need in vivo activation. Its hydrolyzed lactone ring imitates intermediate compound which is produced by the reductase allowing the molecule to bind with a far greater affinity compared to its natural substrate. First, as a result of its reversible inhibition of enzyme HMG-CoA reductase activity, it effects intracellular reductions of cholesterol pools which results in an increase in the number of LDL-receptors on cell surfaces and higher receptor-mediated catabolism and clearance of circulating LDL. Second, by inhibiting hepatic synthesis of VLDL, which is the LDL precursor, pravastatin inhibits the production of LDL. At therapeutic doses of pravastatin can decrease LDL cholesterol by 20-30%, increase HDL cholesterol by 3-10%, and decrease plasma triglycerides by 19-34%. HDL cholesterol has protective effects against cardiovascular diseases, while high LDL and triglyceride levels in blood are associated with higher risk of cardiovascular diseases. For adults the recommended starting dose for pravastatin is 40 mg once per day. If this dose does not achieve appropriate cholesterol levels in blood, the dose of 80 mg once per day is recommended. Patients who have significant renal impairment, a recommended starting dose is 10 mg per day. Pravastatin sodium tablets can be administered as a single dose, orally at any time of the day, with or without food. The maximal effect of a given dose can be seen within 4 weeks. In children who are 8 to 13 years old the recommended dose is 20 mg once per day. There are no studies for this population for the doses higher than 20 mg. In adolescents who are 14 to 18 years old, the recommended starting dose is 40 mg once per day. There are no studies for this population for the doses higher than 40 mg. Dosage adjustments should be made in intervals of 4 weeks or more. For patients taking immunosuppressive medicines such as cyclosporine together with pravastatin, therapy should begin with 10 mg of pravastatin once per day at bedtime and titration to higher doses should be carefully done. A maximum pravastatin dose for most patients treated with this combination is 20 mg daily. The lipid-lowering effects of pravastatin on Total cholesterol and LDL-cholesterol can be improved when combined with a bile-acid-binding resin. When administering a bile-acid-binding resin such as cholestyramine and colestipol with pravastatin, the pravastatin should be given either 1 hour before or at least 4 hours following the resin. Renal Dose Adjustments: For significant renal dysfunction initial dose is 10 mg once per day. Dosage increases should be done with careful monitoring for adverse reactions. Liver Dose Adjustments: initial dose is 10 mg once daily. Dosage increases should be done with careful monitoring for adverse reactions. Absorption: Pravastatin is administered orally in the active form. Clinical studies showed that peak plasma concentrations occurred 1 to 1.5 hours after oral administration. The average oral absorption of pravastatin is 34% and absolute bioavailability is 17% based on urinary recovery of total radiolabeled drug. While the presence of food in the gastrointestinal tract can decrease systemic bioavailability, the lipid-lowering effects of the drug stay the same whether taken with or 1 hour prior to meals. Distribution: Approximately 50% of the circulating pravastatin is bound to plasma proteins. (b) Enzymatic hydroxylation of ring. Pravastatin has extensive first-pass metabolism in the liver. Excretion: Approximately 20% of oral dose is excreted by urine and about 70% is excreted in the feces. After intravenous administration approximately 47% of total body clearance was by renal excretion and 53% is excreted by non-renal routes such as biliary excretion and biotransformation..
Pravastatin has been given pregnancy category X by the FDA. Pravastatin studies on animals have not shown evidence of teratogenicity, but studies with other inhibitors of HMG-CoA reductase revealed an increased incidence of skeletal malformations. HMG-CoA reductase inhibitors can inhibit biosynthetic processes which are necessary for fetal development. There are no controlled data in human pregnancy, therefore pravastatin use is considered contraindicated during pregnancy. Atherosclerosis is a chronic disease and discontinuation of lipid-lowering medications during pregnancy should have lower impact on the outcome of long-term therapy of primary hypercholesterolemia. Cholesterol and other products of cholesterol biosynthesis are very important components for fetal development including synthesis of cell membranes and steroids. Since pravastatin decreases cholesterol synthesis and possibly the synthesis of other biologically active substances which are derived from cholesterol, it is contraindicated during pregnancy and also in nursing mothers. Small amounts of pravastatin can be excreted into human milk, therefore pravastatin is considered to be to be contraindicated during lactation. What special precautions should I follow/ What should I avoid while using Pravastatin? Patients should tell their doctor and pharmacist if they are allergic to pravastatin, or any other medications, or any of the inactive ingredients in pravastatin tablets. They should also tell their doctor or pharmacist if they are taking any prescription and nonprescription medications, herbal products, vitamins, nutritional supplements, or if they have a plan to take them. Patients should tell their doctors if they are taking following drugs: antacids; boceprevir (Victrelis); cimetidine (Tagamet); ritonavir (Norvir) taken with darunavir (Prezista); spironolactone (Aldactone); clarithromycin (Biaxin); colchicine (Colcrys); antifungals such as fluconazole (Diflucan) and ketoconazole (Nizoral); cyclosporine (Neoral, Sandimmune); digoxin (Lanoxin); erythromycin (E.E.S., E-Mycin, Erythrocin); diltiazem (Cardizem, Cartia, Taztia, Tiazac); other cholesterol-lowering medications such as fenofibrate (Tricor), gemfibrozil (Lopid), and niacin (nicotinic acid, Niacor, Niaspan); verapamil (Calan, Covera, Verelan); and warfarin (Coumadin). Their doctor may need to change the doses of such medications or carefully monitor for side effects. If patients are already taking drugs such as cholestyramine (Questran) or colestipol (Colestid), they should take them 4 hours before or 1 hour after pravastatin administration. Patients should tell their doctor if they have liver disease. Doctor will order laboratory tests to see how well liver works even if patient thinks that do not have liver disease. If liver disease exists doctor will probably tell patient not to take pravastatin. Patients should also tell their doctor if they drink more than two alcoholic beverages daily, because alcohol can increase side effects, if they are 65 years of age or older, or if they have or have ever had low blood pressure, seizures, or thyroid or kidney disease, muscle aches or weakness. Women should tell their doctor if they are pregnant or plan to become pregnant. They should not become pregnant while using pravastatin. If they become pregnant while using pravastatin, they should stop taking it and call their doctor immediately for further information because pravastatin may harm the fetus. Breastfeeding is also contraindicated. If patients will have a surgery, including dental surgery, they should tell the doctor or dentist that they are using pravastatin. This medication should be kept in the container it came in, out of reach of children and tightly closed. It should be stored at room temperature and away from extra heat and moisture (not in the bathroom). Outdated medications should be thrown away any medication. Patients should talk with their pharmacist about the proper disposal of this medication. Diet with low-fat and low-cholesterol is recommended. Patients should follow all exercises and dietary recommendations given by their doctor or dietitian. Patients can also visit the National Cholesterol Education Program (NCEP) website for additional dietary information at http://www.nhlbi.nih.gov/health/public/heart/chol/chol_tlc.pdf. The table below shows the incidence of side effects after Pravastatin administration in recommendable doses. The incidence can be increased if this drug is overdosed. Rhabdomyolysis is a serious condition in which damaged skeletal striated muscle cells breaks down very fast. Breakdown products of damaged muscle cells are released into the bloodstream. Some of these products, such as the protein myoglobin, can be very harmful to the kidneys and may lead to kidney failure, disseminated intravascular coagulation and death. Although mild muscle pain is a relatively common side effect of statins, some people who take these medications to lower their cholesterol may have severe muscle pain. This intense pain may be a symptom of a serious condition called rhabdomyolysis. If the dose of statin is higher, the higher is the risk of rhabdomyolysis. The risk increases if certain drugs such as cyclosporine (Sandimmune) and gemfibrozil (Lopid) are taken together with statins. However, the risk of rhabdomyolysis from statin therapy is very low. Expectance is about 1.5 for each 100,000 people on statins therapy. This condition and also other muscles inflammation which are caused by statin can be diagnosed with a blood test measuring levels of the enzyme creatinine kinase. Patients should contact their doctor if they notice moderate or severe muscle pain after starting statins therapy. Pravastatin may cause also other side effects. Call your doctor if you have any unusual problems while taking this medication. In case of overdose, patients should call their local poison control center at 1-800-222-1222. If the victim has collapsed or is not breathing, call local emergency services at 911. The missed dose should be taken as soon as patients remember it. However, if it is almost time for the next dose, patients should skip the missed dose and continue the regular dosing schedule. They should never take a double dose to make up for a missed one. Cyclosporine: The risk of myopathy and rhabdomyolysis is increased if pravastatin is taken together with cyclosporine. Pravastatin should be limited to the doses of 20 mg per day if it is used together with cyclosporine. Clarithromycin: The risk of myopathy and rhabdomyolysis is increased if pravastatin is taken together with clarithromycin. Pravastatin should be limited to the doses of 40 mg per day if it is used together with this drug. Colchicine: The risk of myopathy and rhabdomyolysis is increased if pravastatin is taken together with colchicine. Gemfibrozil: Due to an increased risk of myopathy and rhabdomyolysis when inhibitors of HMG-CoA reductase are used together with gemfibrozil, combination of pravastatin sodium and gemfibrozil should be avoided. Other Fibrates: Due to an increased risk of myopathy and rhabdomyolysis when inhibitors of HMG-CoA reductase are used together with other fibrates, combination of pravastatin sodium and other fibrates should be used with caution. Niacin: The risk of skeletal muscle side effects may be amplified when pravastatin is used together with niacin. Reduction in pravastatin sodium dosage should be considered in this situation. Liver Disease and Alcoholism: The administration of HMG-CoA reductase inhibitors is contraindicated in patients who have active liver disease or constant elevations of serum transaminases. Statins have extensively metabolism in the liver. Reduced drug metabolism may lead to statins accumulation and increased risk of toxicity and side effects including abnormalities of the liver function and in some cases serious condition such as: hepatitis, jaundice, cirrhosis, fatty liver, and fulminant hepatic necrosis. Therapy with statins should be administered cautiously in patients who have a history of liver disease or heavy alcohol use. Lower initial doses may be suitable, and it is recommended clinical monitoring of liver transaminase levels in blood. If patients develop elevated ALT or AST levels during therapy, they should be monitored until abnormalities resolve. If ALT and/or AST are increased above 3 times than normal, consideration should be given to a dosage reduction or discontinuation of therapy. Rhabdomyolysis, Myopathy, Myoneural Disorder: Severe myopathy, including rhabdomyolysis combined with acute renal failure secondary to myoglobinuria, can be caused rarely after the administration of statins. The myopathy is suspected to be dose-related and it is characterized by muscle pain and/or weakness in combination with creatine phosphokinase increased values in blood exceeding the levels of 10 times higher than normal. 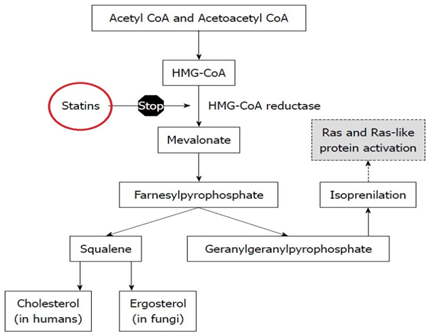 Therapy with statins should be used cautiously especially in patients with preexisting myoneural disorder or myopathy, since it may delay the recognition or confound the diagnosis of a drug-induced musculoskeletal effect. Patients should report immediately any unusual muscle pain, weakness or tenderness, especially if it is accompanied by malaise or fever. Periodic creatine phosphokinase analysis may be considered in some patients. Statins therapy should be discontinued if elevated creatine phosphokinase levels occur or if drug-related myopathy is diagnosed or suspected. Renal Dysfunction: Pravastatin is partially eliminated by the kidney. In patients with significant renal impairment drug or metabolite accumulation may occur, which may increase the risk of toxicity, including hepatic and musculoskeletal side effects. In patients with severely impaired renal function therapy with pravastatin should be administered cautiously. A lower initial dosage may be appropriate, accompanied by clinical monitoring. Your pharmacist or health care provider can provide more information about Pravastatin.